THE HAGUE - The new Dutch government can finally start working now. Al Ministers and Undersecretaries were sworn in before King Willem-Alexander today. The longest government formation process has come to an end. At 12:00 Dutch time the King and his government stood in front of the palace as is customary for the picture moment. 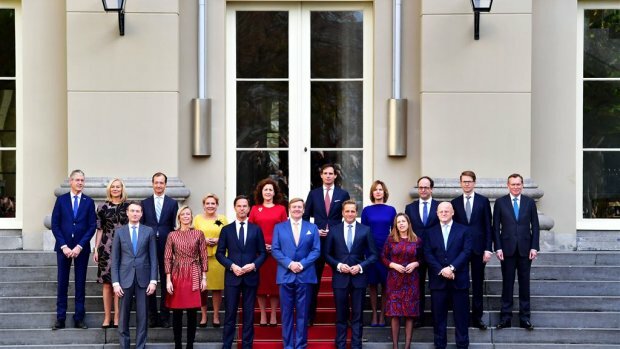 It was the first swearing-in ceremony of a cabinet done by King Willem-Alexander. Rutte II was still sworn in by his mother, former Queen Beatrix. The Ministers and Undersecretary had to make an oath or promise laid down in the law. It involves allegiance to the King and the Constitution. At 4.30 pm there is a meeting of the Council of Ministers scheduled in the Ministry of General Affairs.